A 67-year-old African-American male presented to our emergency department with facial drooling and concern for a possible cerebrovascular event. On further inquiry, the patient revealed sensation of a mass for over 20 years without attributable symptoms. Physical examination demonstrated submucosal fullness of the left retromolar triangle with intact mucosa. No associated facial weakness, soft-tissue swelling or adenopathy was reported. Routine laboratory values were unremarkable. 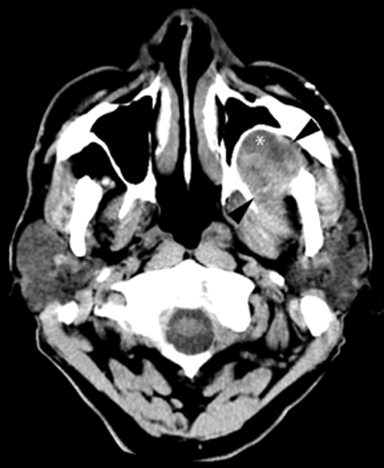 A non-contrasted head CT (Figure 1) performed in the ED to evaluate for stroke incidentally noted a complex mass in the left masticator space with focal areas of low attenuation suggestive of fluid. 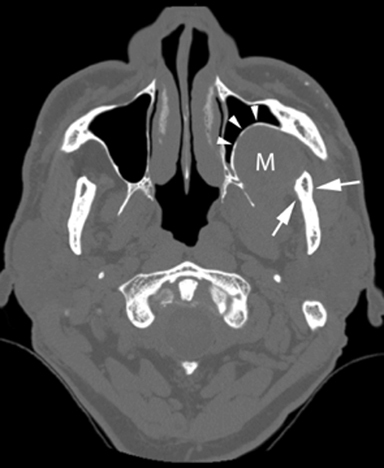 There was regressive remodeling of the adjacent posterior maxillary sinus wall (Figure 2) consistent with a longstanding process rather than a destructive malignant lesion. 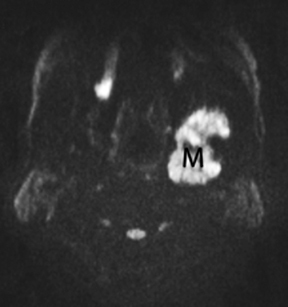 MR of the face without and with intravenous Gadolinium was performed for further evaluation and revealed a corresponding dumbbell shaped, complex mass containing lobulations. The mass was primarily isointense to muscle on T1-weighted images (Figure 3) with heterogeneous enhancement following gadolinium administration (Figure 4). 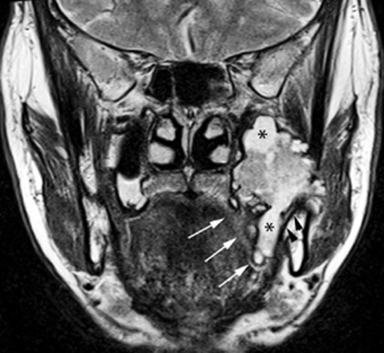 Focal areas of hyperintensity were seen on T2 weighted images consistent with internal cysts (Figure 5). There was preservation of the cortex of the maxillary sinus and maxillary alveolus (Figures 2, 3 and 5) as well as preserved integrity of the gingival mucosa which was best demonstrated on coronal T2 images (Figure 5) and confirmed on clinical examination. Marked hyperintensity was present on DWI with an average apparent diffusion coefficient of 0.9 × 10-3 mm2/s (Figure 6). Extra-gingival peripheral ameloblastoma. Differential diagnoses: neurofibroma or schwannoma of the buccal branch of the left trigeminal nerve, keratocystic odontogenic tumor or solitary fibrous tumor. Intraosseous solid or multi-cystic, the most common type, representing 86% of maxillary ameloblastomas. Intraosseous unicystic, which account for 13% of maxillary ameloblastomas. Malignant ameloblastomas, which are very rare and manifest with metastases, most commonly to the lungs, regional lymph nodes, pleura, vertebrae, skull, diaphragm, liver, parotid glands, and small intestine. Peripheral ameloblastoma is rarely the initial preoperative diagnosis derived from clinical examination or imaging. The typical radiographic appearance of an ameloblastoma is that of a multi-loculated mass with well-defined cystic spaces of varying size with signs of local invasion. However, perineural tumor spread has not been reported with PA.5 The imaging appearance of these tumors is not pathognomonic but it can be characteristic with a “soap bubble” or “honeycomb” appearance with often associated resorption of the adjacent tooth root best seen on CT. 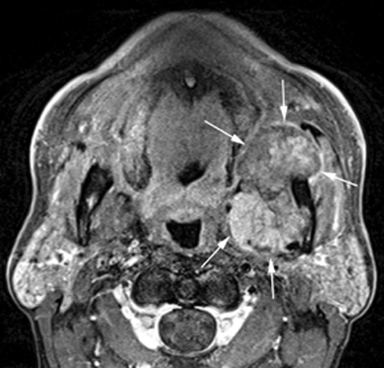 It is sometimes indistinguishable from a dentigerous cyst.6 Often, avid contrast enhancement is seen in the solid portions of the tumor with marked hyperintensity on T2-weighted sequences related to the cystic nature of the lesions. Calcifications are unusual.2 CT and MR are crucial in their contribution to preoperative planning by delineating the anatomic extent. Treatment of PA consists of complete surgical excision. Amelobastomas are slow-growing with a tendency to spread into marrow spaces with pseudopods without concomitant resorption of trabecular bone. As a result, their margins are not clearly evident radiographically or grossly during surgery.6 Therefore, they have a high propensity to recur. Peripheral ameloblastomas are exceedingly rare tumors, making up about 1% of all ameloblastomas. The imaging appearance of these tumors is not pathognomonic but often displays a characteristic “soap bubble” or “honeycomb” appearance with resorption of the adjacent tooth root, particularly when seen in the retromolar aspect of the mandible. Vanoven BJ, Petruzelli GJ. Peripheral ameloblastoma of the maxilla: a case report and literature review. American Journal of Otolaryngology. 2008;29:357-360. Weissman JL, Snyderman CH, Yousem SA, Curtin HD. 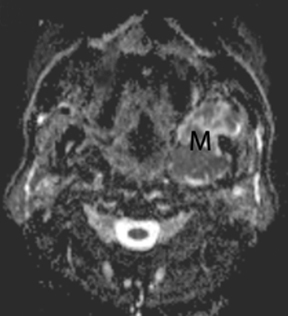 Ameloblastoma of the maxilla: CT and MR appearance. American Journal of Neuroradiology. 1993;14:223-226. Martelli-Junior HD, Souza LN, Nogueira SLA, Melo-Filho MR, De Paula, AMB. Peripheral ameloblastoma. Oral Surgery Oral Medicine Oral Pathology Oral Radiology and Endodontology. 2005;99:E31-3. Philipsen HP, et al. Peripheral ameloblastoma: biological profile based on 160 cases from the literature. Oral Oncol. 2001; 37:17-27. Garcia RMIM, Blanco, RJA; Garcia CM; Verrier HA. Ameloblastomas maxilares: a proposito de dos casos clinicos. Acta Otorrinolaringolo Esp. 2001;52:261-265. Iordanidis SM, Dimitrakopoulos J, Kariki H. Ameloblastoma of the maxilla. Case report. Australian Dental Journal. 1999;44:51-55. Surya V et al. A case of peripheral ameloblastoma of retromolar trigone: Histopathological and immunohistochemical profile. Contemporary Clinical Dentistry. 2015;6(4):564-566. Das A. Benign neck masses showing restricted diffusion: Is there a histological basis for discordant behavior? World J Radiol. 2016;8(2):174-182. 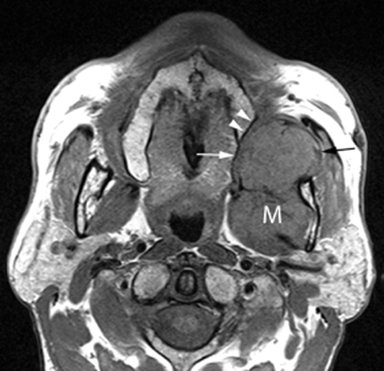 Das A. Diffusion-weighted imaging in extracranial head and neck schwannomas: A distinctive appearance. Indian J Radiol Imaging, 26(2): 231-236. Mosier KM. Magnetic resonance imaging of the maxilla and mandible: signal characteristics and features in the differential diagnosis of common lesions. Top Magn Reson Imaging. 2015;(24)1: 23-37. Nurkic T, Castillo-Jorge S, Schmalfuss I. Extra-gingival peripheral ameloblastoma. Appl Radiol. 2018;47(9):38-40. Prepared by Dr. Nurkic while a Radiology Resident and Dr. Castillo while a Neuroradiology Fellow at the University of Florida in Gainesville, FL; and Dr. Schmalfuss while a Professor of Radiology at the University of Florida, and a Radiologist at the North Florida/South Georgia Veterans Administration in Gainesville, FL.